9. While visiting a tourism fair in Madrid on Wednesday, Queen Letizia of Spain wore her Tous cultured pearl drop earrings. 8. In a departure from her usual minimalist jewelry style, Charlotte Casiraghi, daughter of Princess Caroline of Monaco, wore statement earrings during a gala dinner in Geneva on Monday. 7. Speaking of a departure from the usual -- look at the earrings that Princess Stephanie of Monaco wore at the annual circus festival on Saturday! I don't know what's gotten into the Monegasque jewelry water, but I like it. 5. Queen Elizabeth II of the United Kingdom attended a church service near the Sandringham estate on Sunday. For the occasion, she chose one of her most-worn brooches: the Frosted Sunflower Brooch. 3. Queen Elizabeth II wore the largest of the three Nizam of Hyderabad Rose Brooches to a Women's Institute meeting on Thursday. 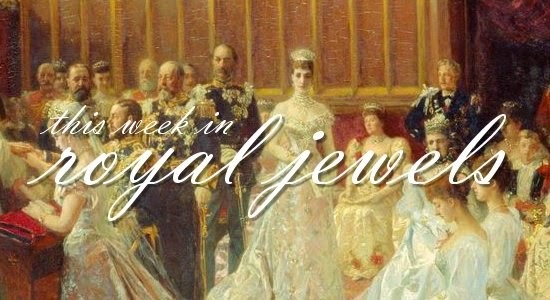 To read more about the Cartier-made brooches and the dearly-departed tiara that once housed them, check out this post. 1. My number one spot this week goes to the three Scandinavian queens, who all wore beautiful jewels during the most glittering of the Jubilee events. Queen Silvia's diamond floral brooch, Queen Margrethe's sapphire demi-parure, and Queen Sonja's diamond and pearl brooch were all stunners, and I couldn't choose just one!